I put these together last year for the ladies at work for admin. appreciation. Party mix-get it? So easy, but cute. 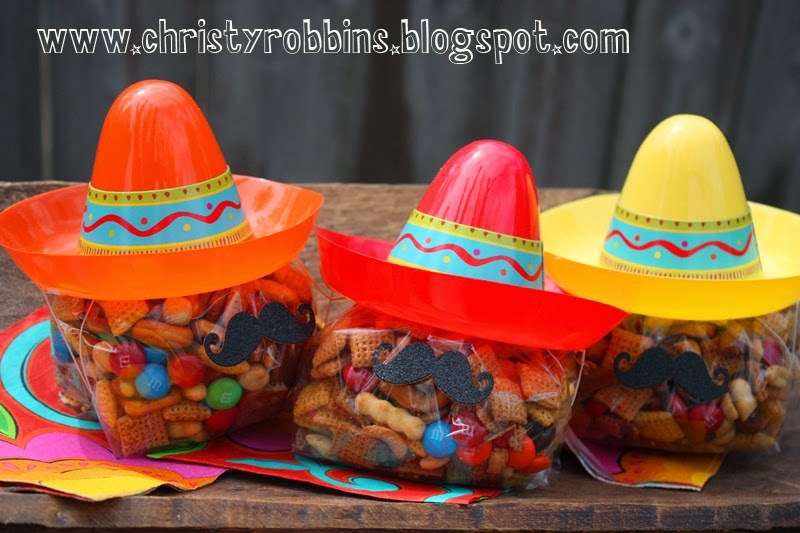 I filled bags with a mix of color candies and salt sweet snacks, then just added the mini sombreros I got at Party City (I've also seen them on Amazon), and I taped on some little glittered mustaches that are actually confetti I saw at Walmart. I attached a tag and they were ready to go. I made this last fall for one of my teaching friends. I got some Swedish Fish....gold fish would work as well, and I filled a fish bowl I grabbed at the dollar tree. Think of all the things you could be 'o 'fish' ially' thanking someone for. Regardless...cute and easy. 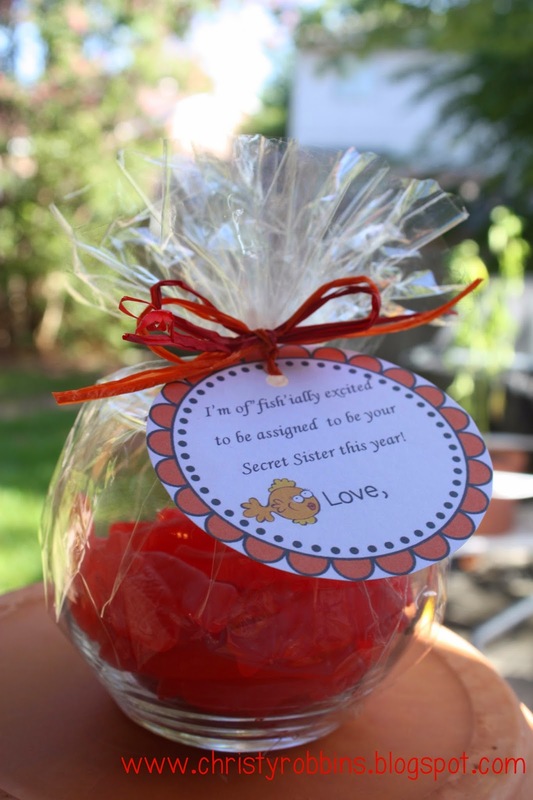 I recently helped host a bridal shower for one of my good friend's daughters. I'll be posting all the details soon. She met the groom at a Ranger's game and is an avid Ranger's fan...we kept that in mind while planning. I found these adorable vintage style cracker jack boxes on Amazon-they cost less than a buck each when you buy them as packs of 24. I added a sports tag and some tickets. 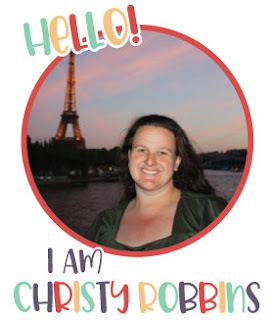 As a teacher...I hit up some of my nearby teacher friends so that I could get the right colors. I found a baseball stamp and stamped it in the middle of the blue ticket (loved these blank tickets from US Toys). Sooooo much easier than my original plan! All the details coming soon! Last month I threw a baby shower luncheon for my friend Nicole. She is expecting her first little one in a week or two. She and her husband decided to wait to find out the gender, so I hunted on her registry for a semi theme and found she had registered for some different ducky things. I bought a little bundt cake for the occasion and found this little stand at Home Goods. I threaded some yellow ribbon through the holes. It made it a little more fun than the cardboard these cakes usually come on. I blogged about these last month. I made some lemon scented bath salts. It's hard to bring too much when we eat at tea rooms b/c they usually have a lot of cute decorations of their own, but this was a little something I figured could fit easily on the table. Nicole grew up in Dallas, but she has lived in Houston for 11 years. I've been trying to change that for awhile (11 years). I bought everything I could find off her registry that was duck related. I'm all about personalizing gifts, but with no name and no gender, I only embroidered a few little duck things. I told her I'd catch up on my personalizing over the next 18 years. Nicole's sister had her first little guy just three weeks ago. Her Mom has been waiting for this 'grandma' thing for quite awhile, so I'd say the ladies are doing a nice job giving her her grandchild fix. I, for one, can't wait to meet the little one. There is a lot of spoiling that's about to happen, though I figure I have to take a number. I was a little skeptical about how this tshirt bag would work without my sewing machine....but I'm all for letting that machine collect dust in the closet whenever possible, and guess what....this worked great! I saw the original idea for this on this mommyblog. If you have a closet full of old tshirts....and a city nearby (Dallas) who has started charging for bags at stores....here's a great idea for making your own. The perk to these is you can wash them. All you need is an old tshirt and scissors. Cut off the sleeves (right near the seam to the sleeve. Figure out how big you want your bag to be and cut large fringe pieces (about an inch) up to where you want the bottom of the bag to be. Depending on the material, keep in mind, it's a shirt, so it will stretch a little. Take the two pieces sitting side by side and tie them in a knot. Do this to the next two pieces. Now....take half of each of those and tie them together (so it creates a second layer of knots). This prevents there from being little holes between the ties because each tied piece is then tied to the one next to it. Turn the shirt so the outside is showing again (the fringe will just rest at the bottom of your bag). Now cut off the collar. The goal is it to look like half an oval. This is going to be your bag opening. You are ready to roll. I tied the two handles at the top just to give it a little more strength when carrying. This took me about 10 minutes tops. I helped host a bridal shower for my friend Mary's daughter a week ago. Her daughter is less traditional as far as petite fours and dinner mints go, so we went with a baseball theme. She meat her husband-to-be at a baseball game, and her bridesmaids even took her to a game for her bachelorette the same weekend as her shower. I put together this little sign to prop up on the table. I bought a big wooden A at the craft store and just painted red laces down each side. I used a permanent marker to add some details and gray paint to add some character. When I was finished there was just something missing, so I took a tooth brush and flicked black paint all over it. I find this usually helps make everything look better...with the exception of clothing maybe. I added a wire an a ribbon so she can hang it later on her new home...or not, but....it served it's purpose for the shower. :O) More details to come soon! I bought a waffle iron this last year at the black Friday sales. I'm a sucker. To justify my purchase, I decided to try out some recipes. This recipe from bunsinmy oven was really delicious. You can really taste the cinnamon, and it paired well with maple syrup. 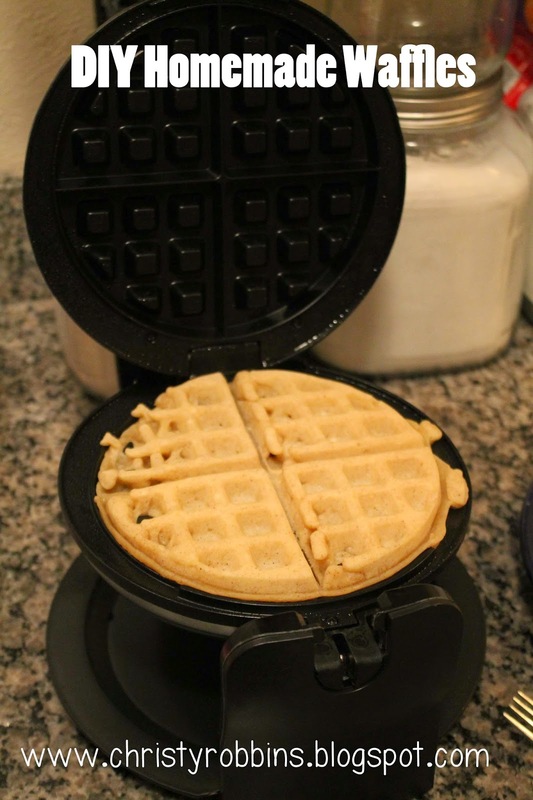 If you found yourself a victim to black Friday impulse buys, or just need to brush off the dust from the ol' waffle iron-this is a tasty recipe! 2. Mix flour, cornstarch, salt, cinnamon, nutmeg, baking powder, and baking soda. 3. Mix the buttermilk, milk, and vegetable oil ad stir in the egg yolk. 4. Beat the egg white until almost to soft peaks. Sprinkle in sugar, and beat until peaks are firm. Add vanilla. 5. Pour the buttermilk mix into the dry mix and whisk until well mixed. Drop in the egg white mix and fold in until just incorporated. 6. Bake in waffle iron as instructed. I'll eventually post a picture of this desk sitting in it's new home...I'm just taking my time finding the perfect items for the innards. 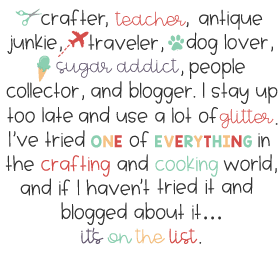 I do a lot of crafts....thus the blog, but this one was really personal. I loved this desk when it sat in my Mom's room. It had been her desk when she was a little girl. At that time it was already 50 years old. Now....it's working on more than 100 years of surviving and thriving in our family. Before it was her desk, it was her Mom's, and before that it was her Mom's mother's sister's desk. Her sister died when she was just 24 years old. Once upon a time this desk was red. At some point it was stained white and antiqued. It's had several hinges, and was down to one hinge....that then broke, and the outside shelf fell off...and split in two. Age wasn't kind to the coloring. I found little pieces of tape that petrified to the wood....I have a feeling I was responsible for that. I enlisted my brother to fix the desk portion and I then I made my first foray into chalk paint. I realize, I'm late to the party. I was told by my friend that I missed the party completely and chalk paint was 'out.' I don't believe that-I still see chalk painted items-real and fake in every store I visit. I also found some for sale at JoAnne's. I used a coupon to make it even cheaper. I bought some the color of 'sheepskin' and some brown and clear wax. The deal is you aren't supposed to have to sand old paint off-it's supposed to cover it up completely. I'm not so sure if it's this particular paint, but mine did not dry smooth. It crackled a little. In the end-that was the look I was going for-so it saved me some sanding etc to make it look more aged. All that to say-if you want a smooth coat-don't paint over fifty year old paint...if you wanted crackle-use this. I then took some of the brown paint and rubbed it along the edges and made some streaks across the white panels. I took a wet paper towel and started streaking the paint around so that it looked more 'aged' and uneven. Once the brown wax dried I covered the whole thing with a thin coat of clear wax. I let is rest for 6 days-per the instructions. There were a few things I bought new-one were these little glass handles (from Hobby Lobby-half off-so 4 bucks total). The original handles were long gone. The old hinges were missing pieces...I decided to leave the indention b/c I kind of like the stories they tell. The priciest part of these projects were these new old hinges I bought on ebay. I wanted them to be authentic to the time. I found two antique 'butterfly' hinges. I decided the arms were just not worth finding antique-since I'm keeping it-I think it's fine. I had my brother attach these pieces. I love that it folds out to become a desk you can write on. My FAVORITE part are the little cubbies at the top. The little drawer in the middles pull is actually a little nail. I spent hours messing with these cubbies when I was little....and I have the crayon remnants to prove it on the bottom of the drawer. I also repainted the chair. These have now found a home in my room. Tags: Antiques, Bedroom, Chalk Paint, Home "Repairs"
I'm the fan of the casserole...especially when it comes to morning meals. I am NOT a morning person. Don't get me wrong, my whole life requires that I get up early every morning, but I don't like it, and the last thing I feel like thinking about is breakfast. As gourmet as I get-sometimes I swap out a granola bar for instant oatmeal. So...when it comes to an easy, hearty casserole-count me in. 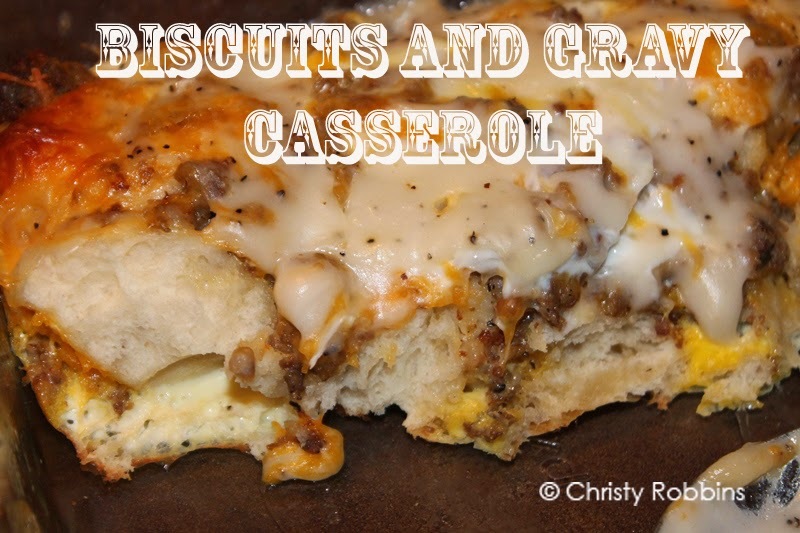 Ingredients: 10 oz tube biscuits, 6 eggs, 1 lb sausage, 1 c cheese (shredded), 1/2 c. milk, salt and pepper to taste, gravy packet. 1. Spray a 13x9 inch pan with cooking spray. 2. Cut biscuits into 4ths. Line bottom of the ban. 3. Brown and drain sausage. Scatter on top of the biscuit pieces. Top with shredded cheese. 4. Whisk eggs and milk and salt and pepper and pour over the pan. 5. Make gravy according to the pkg instructions. Pour over the pan. 6. Bake for 40 minutes at 350. 7. Cut and serve warm from the oven. 1. In one bowl mix all the dry ingredients except for the sugar. 2. In a second bowl mix butter and sugar and beat until light and fluffy (about 2 minutes). Add the vanilla and eggs until mixed well. Slowly add the flour mix. 3. Fold in the chips and blueberries. 4. Drop onto lined baking sheet. 5. Bake at 350 for 7-8 minutes. Cool and serve. On Good Morning, Texas I'll be sharing a 'how to' on kites. I'll post the video later on facebook. My goal was to use the cheapest supplies I could find. You could use a garbage bag or butcher paper to put together these kites, but I splurged and bought a table cloth for a dollar....which makes 6+ kites. I glued together two sticks together. I found some thin sticks for less than a buck at the craft store. The glue was just to hold them in place. I went back over the center with some string to hold it tightly. I then took the same string and wrapped it around each arm. I taped it to the sticks to hold it's shape. I measured out the plastic tablecloth so it was about 11/2 inch extra around each side. I punched a hole and strung another string through this, tied it off, leaving it a little loose. This is what I attached the kite string too. I added a string with a tail. I used some ribbon. This helps weight down the bottom so that it's heavier on the bottom and can catch some wind. I also made some mini kites that I dangled from dowel rods and covered in some vintage looking fabric.